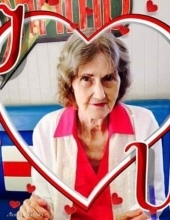 Chloe Lucille Leffew, 83, of Raysal, WV, passed away Sunday, April 7, 2019 in the Wake Forest Baptist Hospital in Winston-Salem, NC. Chloe was born June 10, 1935, at Rockridge, WV, a daughter of the late Troutman and Martha Kennedy Roberts. She was a home maker and a member of the Church of God; she loved her Lord Jesus. Chloe loved her cats and her neighbors Donna Puckett and Connie Deel. In addition to her parents Chloe was preceded in death by one son, Charles Leffew; one brother, William Ben Roberts, two sisters, Lottie Short and Frances Sims; and one great granddaughter, Leara Lowe. Survivors include two daughters, Jackie Lowe and her fiancé, Craig Lyons of Raleigh, NC, and Lynn Sessoms and husband Chris of Winston-Salem, NC; two sisters, Pearl Mullins of Bradshaw, WV and Rebecca Kennedy of Dillon, VA; two grandsons, Aaron Lowe and wife Leanna of Richlands, VA and Todd Mullins and wife Amy of Raysal, WV; five great grandchildren, Brittany Mullins, Megan Mullins, Gracie Mullins, Parker Lowe, Paisley Lowe; three step great grandchildren, Britt Shupe, Gracie Shupe and Erica Burton; and one great-great grandchild Zane Mullins; and numerous nieces and nephews. Funeral services will be conducted Saturday, April 13, 2019 at 2 o’clock with Reverend Oscar Roberts and Reverend Terry Coleman officiating at the Bradshaw Church of God in Bradshaw, WV. Burial will follow in Tom Sparks Cemetery on Rockridge near Paynesville, WV. Family and friends will serve as pallbearers. Friends may visit with the family Saturday, April 13, 2019, from 12 noon until time of services at 2 p.m.
To send flowers or a remembrance gift to the family of Chloe Lucille Leffew, please visit our Tribute Store. "Email Address" would like to share the life celebration of Chloe Lucille Leffew. Click on the "link" to go to share a favorite memory or leave a condolence message for the family.